Keep up to date with all the latest action and results with our daily JC Lindsay Scottish Junior Open 2018 recap. Don’t worry if you can’t make the competition, our live blog will take you courtside so you won’t miss a thing. The following age groups will be taking place at the locations detailed below on Friday 28th and Saturday 29th December. All age group finals and 3rd/4th play-off matches as well as the medal presentation will take place at Edinburgh Sports Club on Sunday 30th December. All remaining play-off matches will likely remain at the venue which they started at but further information will be available throughout the competition. 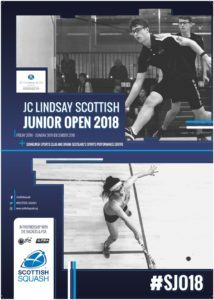 Scottish Squash are pleased to announce that entry into the 2018 JC Lindsay Scottish Junior Open are now being accepted. Individuals looking to enter the event should enter online through the European Squash Tournament Software website. Individuals/groups looking to enter the event and purchase a tournament package which includes accommodation, meals and transport should complete the entry form and not enter online. Full details around the event and further information on entry can be found by clicking here. This seasons competition will run from Friday 28th December – Sunday 30th December 2018 at Edinburgh Sports Club and Oriam, Heriot-Watt University in Edinburgh. We are aiming to open entries on the week beginning Monday 3rd September 2018 so please continue to check back here. Scottish Squash are extremely delighted to announce that JC Lindsay have confirmed they will sponsor the event for a third year with Eye Rackets being a key partner in the successful delivery of the 2018 competition. The date between Christmas and New Year will allow players to travel to the UK to compete in the JC Lindsay Scottish Junior Open prior to the Dunlop British Junior Open which takes place in Birmingham from 2nd – 6th January 2019. Scottish Squash are proud to announce they are working in partnership with England Squash to support players to be able to play in the JC Lindsay Scottish Junior Open and Dunlop British Junior Open shortly after.